Calcium Citrate with vitamin D is a high efficiency calcium that allows maximum calcium absorption and utilization due to the calcium source and addition of Vitamin D. It is the superior bioavailable calcium formula. 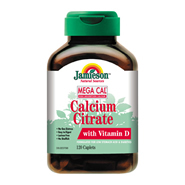 Jamieson Calcium Citrate with Vitamin D for strong bones and teeth. The recommended Calcium form for those with low stomach acid like the elderly. Each caplet contains: Elemental Calcium (from calcium citrate) 250mg, Vitamin D3 (Cholecalciferol) 50IU.